(Trent Nelson | The Salt Lake Tribune) A train yard on the north end of Salt Lake City on Tuesday Feb. 5, 2019. A lawmaker would like to help Union Pacific and other rail carriers acquire cleaner "freight switchers," locomotives that assemble and rearrange train cars for long hauls. A relatively small number of vehicles is responsible for an outsized share of Utah’s mucky air, yet state regulators are powerless to force their owners to operate cleaner machines. They are locomotives called “freight switchers,” which move freight cars back and forth in rail yards in Salt Lake City and Ogden as they assemble and rearrange trains for long hauls. Rail companies operate 63 in Utah and not one meets even the Environmental Protection Agency’s Tier 1 emission standard. Rep. Steven Handy has proposed a solution that would encourage operators to upgrade to the highest Tier 4 standard by footing 35 percent of the cost in a $2 million pilot program. This state money could get three of these locomotives to Tier 4, which would cut their emissions of particulate matter and nitrogen oxide by nearly 90 percent, Handy told the House Natural Resources, Agriculture and Environment Committee on Tuesday. The Layton Republican’s HB98, written in collaboration with Union Pacific executives, targets locomotives with less than 2,300 horsepower, a criteria that squares with the EPA’s definition of a freight switcher. While U.P. has 43 locomotives in freight-switching service in Utah, only 14 meet this criteria, with the rest exceeding 3,000 horsepower, according to spokeswoman Kristen South. Locomotives are designed for decades of service but every 15 years many undergo a major overhaul known as a “repower.” Under federal regulations, rail operators must buy Tier 4 when they replace a locomotive, but that requirement does not apply when they repower one. In those cases the requirement is for only slight upgrades in emissions standards. Accordingly, all the locomotives in service as freight switchers in Utah are at Tier 0 or 0-plus, said Glade Sowards, an analyst with the Utah Division of Air Quality. “These old locomotives can be remanufactured to the Tier 0-plus standard kind of indefinitely,” he told the committee. And rail traffic is expected to increase — perhaps dramatically — when the state’s inland port comes on line in west Salt Lake City. 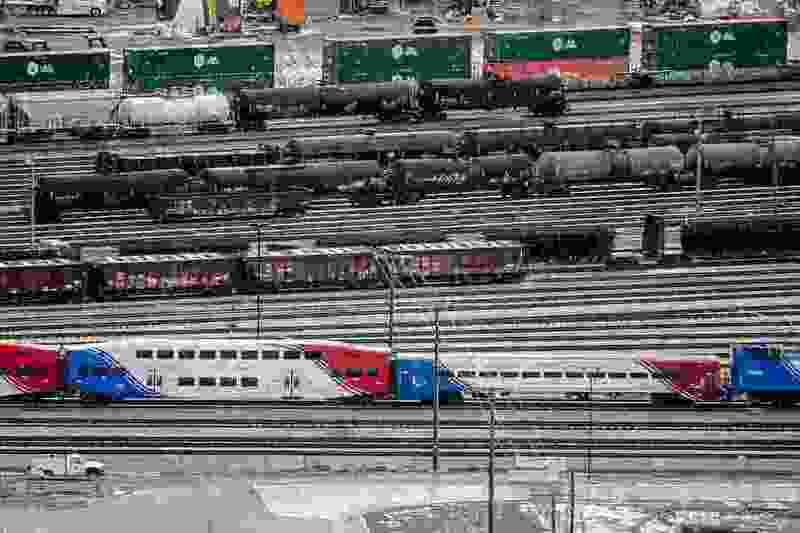 A companion bill, HCR3, is a nonbinding resolution calling on the EPA to impose more stringent emission standards on rail operators when they “repower” locomotives used for freight switching. U.P. is working with an experimental technology to repower a certain model of locomotive to Tier 4, but it is expensive and can be used on only six of the company’s Utah locomotives, according to Nathan Anderson, a U.P. official who addressed lawmakers Tuesday. Under Handy’s bill, a state grant would cover 35 percent of the cost of such upgrades, while federal sources would cover 40 percent and the rail operator would put up the remaining 25 percent. The Division of Air Quality’s 2014 emissions inventory indicates freight switchers accounted for more than 400 tons of nitrogen oxide and 8.8 tons of direct small particulate matter. The $2 million appropriation Handy seeks would help upgrade three locomotives to Tier 4, resulting in an annual reduction of 15 tons. That cost per ton compares well with most other emission-reduction investments. The bill advanced out committee Tuesday, but a similar measure that failed last year ran into resistance from lawmakers concerned about directing taxpayer dollars to a company that sees more than $1 billion in revenue. U.P. has made massive investments upgrading its fleet and retiring 3,200 older locomotives since 2000, according to South. “We are every year investing in new technology that makes us more environmentally responsibly and emit less particulate,” she said in an interview.